Magnatone was founded in the early 1930’s by Delbert Dickerson. Dickerson initially focused guitars and amps for Hawaiian guitar enthusiasts. Dickerson Musical Instruments was formed in 1939 offering a wider range of guitars and amps. Gaston factor Guitar Studios bought Dickerson Musical magnatone-amps.pngaround 1944 and resold the business in 1946 to Art Duhamell. Duhamell changed the company name to Magna Electronics and sold gear under the Magnatone brand. By the early 50’s Magnatone amps featured improved amp circuits and a new Deco look. Magnatone was sold again in 1957, the same year they introduced the Custom 200 series including the Magnatone 250 and the Magnatone 280 favored by Buddy Holley. These amps bigger much more powerful amps and included vibrato. The Magnatone Professional 190A was introduced in 1959. Magnatone introduced the Custom series amps in 1963, 60’s models included the M7, M10, M12, M14 and M15. One big change was the incorporation of Alnico Magnets on an 8” speaker; these were later replaced by 10” Jensen with a ceramic magnet. They also offered a convertible control panel that could be either front or rear facing. Magnatone was sold several times but never managed to emerge from the shadow of Fender and Ampeg. After a series of missteps caused by poor management decisions and plant relocations Magnatone closed it’s doors. After four decades the Magnatone brand was re-launched in January of 2013. 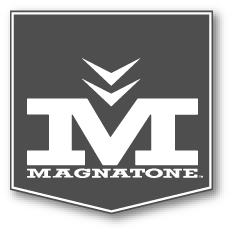 Magnatone currently offers three amp lines. The Studio Series, the Traditional Series and the Master Series. All amps are hand wired point to point, built in the USA and feature Magnatone’s pitch shifting vibrato circuit. They’re rock solid and built to last a lifetime. The Studio series offers the El84 powered 15 watt Varsity and the Surprising 10 watt Lyric. They’re small amps with a big punch. Great for the studio and gigs. The Traditional serie3s is a collection of very powerful versatile amps with that legendary clean American sound and that killer pitch shifting vibrato Magnatone is famous for. The Twilighter uses a pair of 6V6’s and a 12” speaker and is conservatively rated at 22 watts while the stereo Twilighter offers 22+22 watts. The Single V incorporates dual 12” speakers and two 6L6’s rated at 30 watts for incredible clarity, focus and depth. The Master Collection offers the Super Fifty-Nine, a 45 watt powerhouse driven by a pair of EL84’s. This amp was developed in conjunction with Billy Gibbons. The Super fifty-Nine has two channels, a “Classic” channel for a punchy Vox AC30 tone utilizing a classic dual stage vibrato and conventional tremolo and a “Modern” channel with and, volume and classic 3 band EQ controls which allows players to recreate a wide range of 70’s, 80’s and modern tones. Famous Magnatone players include Buddy Holly, David Gilmour and Neil Young. See why we’re so excited about the return of Magnatone.